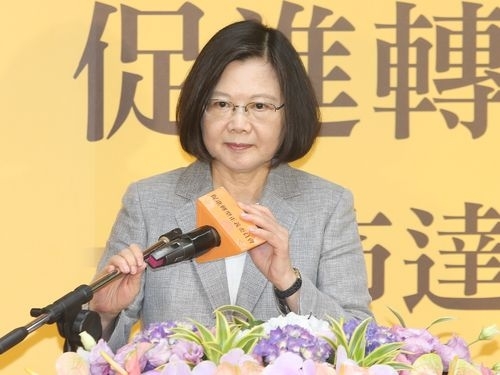 Taipei, May 31 (CNA) President Tsai Ing-wen (蔡英文) said Thursday that Beijing’s suppression of Taiwan is a shared concern among neighboring countries, according to a Presidential Office statement. The statement said this is because China could ultimately alter the state of the Asia-Pacific region as it tries to unilaterally change the status quo across the Taiwan Strait. While receiving visiting foreign scholars attending a forum on maritime security, Tsai said that since taking office, she has endeavored to maintain the cross-strait status quo in order to ensure peace, prosperity and development in the region. Regrettably, however, China has done the opposite, Tsai stated, listing examples of its unilateral attempts to change the status quo such as the activation of the northbound flight route M503 and three extension routes, frequent military drills around Taiwan, demands to foreign companies to change their designation of Taiwan, and suppression of Taiwan’s international participation. These actions, according to Tsai, have made neighboring countries worried that the status quo of the entire Asia-Pacific region will ultimately be changed. Despite the pressure Taiwan is facing from Beijing, it will do its best to contribute to the stability and growth of the region, the president said, adding that this is why the government is so supportive of the forum on maritime security. The Presidential Office statement went on to note that Tsai very much looks forward to the establishment of diverse dialogue channels with neighboring countries to settle trade disputes, combat crime at sea and assist in rescue missions.